Body fossils are the remains of the body parts of ancient animals, plants, and other life forms. They tell us something about the appearance of ancient life forms. 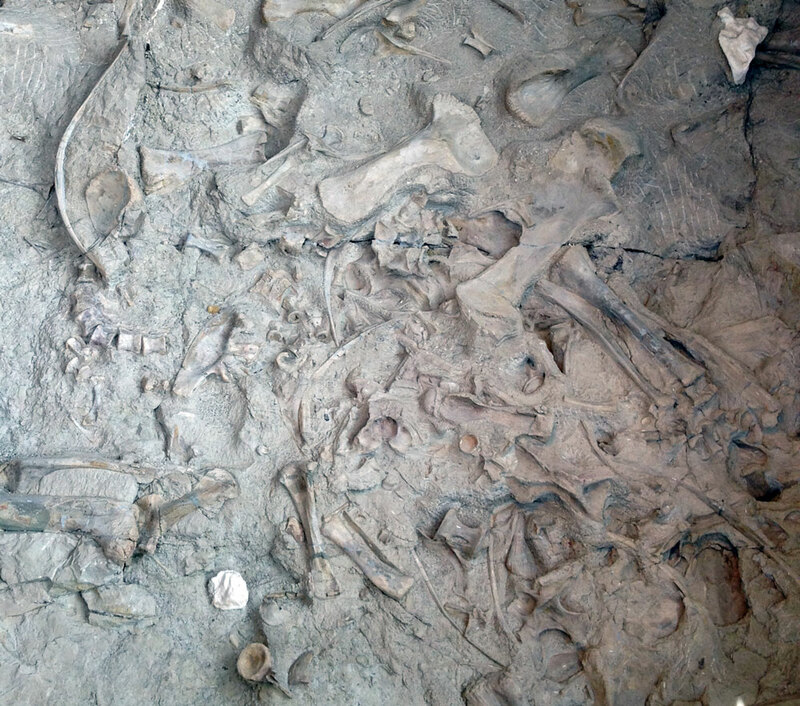 A wall of large dinosaur bones (permineralized remains) from the Jurassic period on display at Dinosaur National Monument, Colorado. The fossil bones of large vertebrates like dinosaurs are only very rarely found connected, or articulated. Typically, they are not found attached to each other (i.e., they are disarticulated), as is the case here. This requires the scientists who study the bones to make interpretations about how the bones might have fit together when the animal was alive. As new scientific discoveries are made, reconstructions of individual dinosaur species often change, requiring museums to rebuild their specimens on display and artists to create new illustrations. Jurassic dinosaur bones preserved on a naturally uplifted, nearly vertical wall at Dinosaur National Monument, Colorado. Photograph by Jonathan R. Hendricks. This work is licensed under a Creative Commons Attribution-ShareAlike 4.0 International License. A fossilized leaf from the Eocene-aged Green River Formation (preserved as a carbonization). Because of the excellent quality of preservation, little imagination is required to reconstruct the appearance of the once-living leaf. This specimen is on display at the Utah Field House of Natural History in Vernal, Utah. 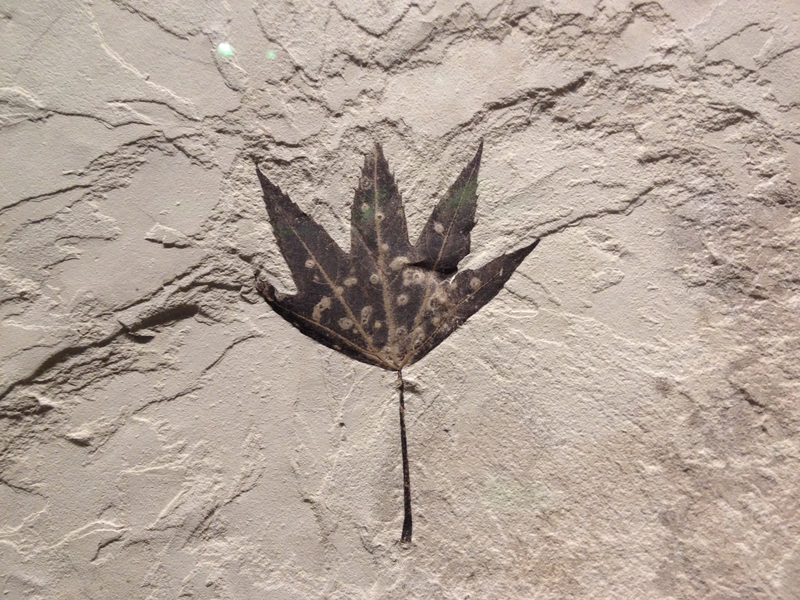 A carbonized fossil plant leaf (likely from a sycamore or plane tree) from the Eocene Green River Formation (on display at the Utah Field House of Natural History, Vernal, Utah). Photograph by Jonathan R. Hendricks. This work is licensed under a Creative Commons Attribution-ShareAlike 4.0 International License. 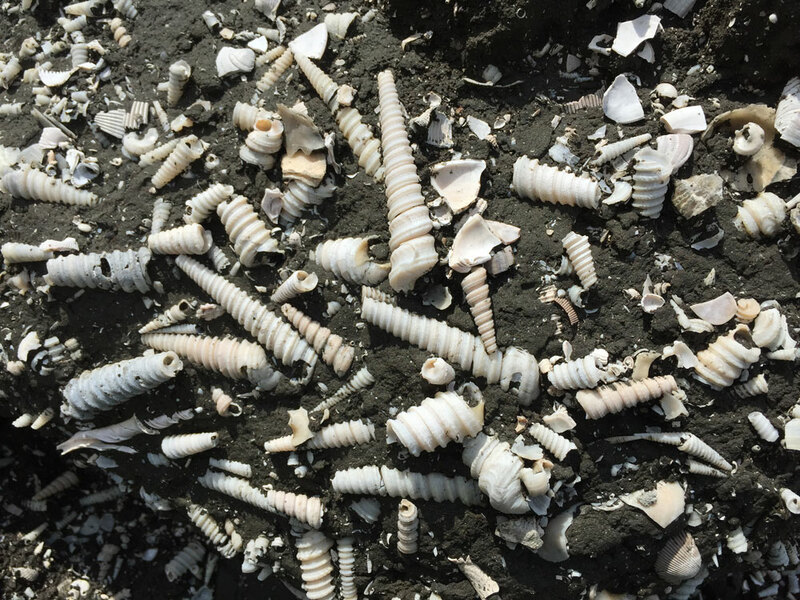 An assemblage of well-preserved fossil Turritella snail shells from the Miocene-aged Gatun Formation of Panama, showing unaltered preservation, despite being over 10 million years old. Assemblage of fossil Turritella snail shells from the Miocene Gatun Formation of Panama. Photograph by Jonathan R. Hendricks. This work is licensed under a Creative Commons Attribution-ShareAlike 4.0 International License. As their name implies, movement trace fossils tell us about how ancient animals moved within their habitats. It is easy to grasp why such fossils are so useful for understanding ancient life. Consider the footprints you might leave behind as you walk on a sandy beach or through the snow. While they don’t reveal much about your appearance (besides the general size and shape of the bottom of your foot or shoe), they reveal the direction you were moving, whether you were traveling alone or in a group, and also provide clues about whether you were walking (footprints close together) or running (footprints further apart). Dinosaur footprints provide the best examples of movement trace fossils and provide paleontologists with the same kinds of clues that human footprints do. Jurassic-aged dinosaur footprints on display in Snee Hall on the Cornell University campus. These were collected from Connecticut or Massachusetts. Photograph by Jonathan R. Hendricks. This work is licensed under a Creative Commons Attribution-ShareAlike 4.0 International License. Discoveries of dinosaur footprints and trackways–left behind in soft sediment that later turned to rock–are not altogether rare and new discoveries are made regularly. For example, a massive footprint left behind by a titanosaur was recently discovered in the Gobi Desert. Not all movement trace fossils are footprints, however. Other types of movement traces include the trails and burrows left behind by animals in the sediment before it hardened. Sediments that were heavily mixed by burrowing organisms prior to turning to rock are said to be bioturbated. Such bioturbated rocks usually lack finely preserved layers; the absence of such layers is sometimes an indication for geologists that the sediments were well oxygenated, thus allowing animals to crawl through them. 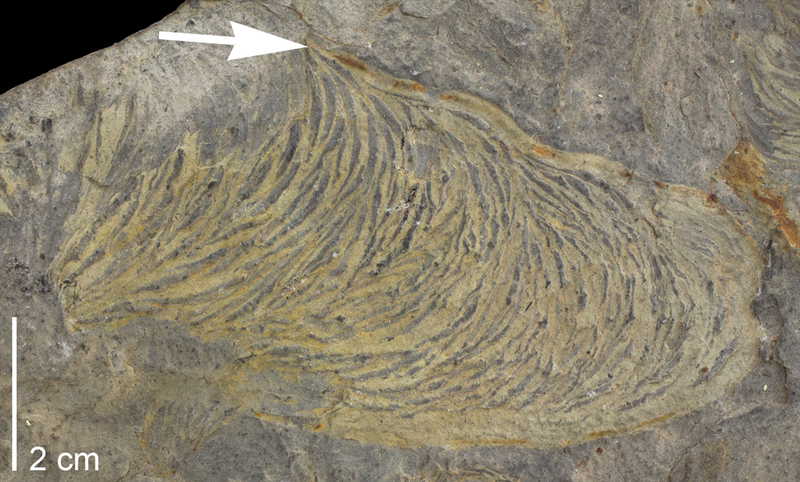 The specimen shown below is a common type of movement trace fossil called Zoophycos. The animal (likely a worm) that made the trace probably lived in a burrow near the position indicated by the arrow. The clockwise swirling lines may indicate the sweeping motions of a feeding structure that gathered food from the sediment. A specimen of the movement trace fossil Zoophycos from the collections of the Paleontological Research Institution, Ithaca, New York. Photograph by Jonathan R. Hendricks. This work is licensed under a Creative Commons Attribution-ShareAlike 4.0 International License. Feeding trace fossils are usually predatory in nature. They are important because they provide a record of ancient ecological interactions between species, as well as indicate how these interactions may have changed over time. Some modern snails, especially naticids and muricids, attack their prey (usually bivalves or other snails) by first drilling holes into their shells. Paleontologists commonly find similar holes in fossil shells, allowing them to assume that the same kinds of predators made the holes in the past. This assumption is bolstered by the fact that the shells of the predators themselves are often found in the same deposits. 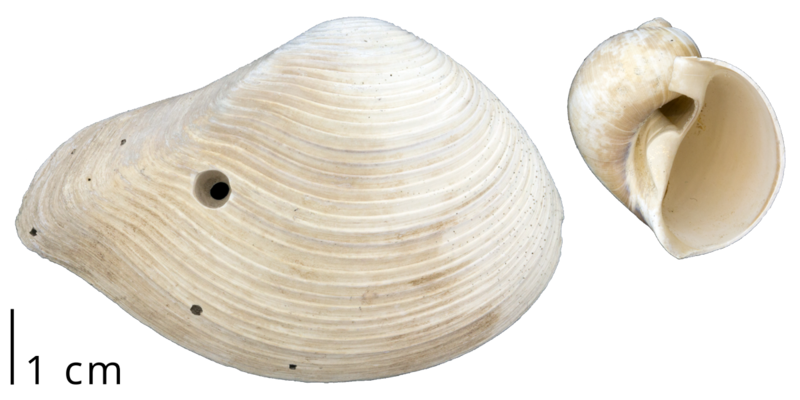 Left: a fossil specimen of the bivalve Eucrassatella speciosa (PRI 70053) showing a drill hole made by a predatory snail. Right: a fossil naticid snail, Naticarius plicatella (PRI 70044). This species, or a closely related species, likely made the drill hole shown on the bivalve. Both fossils were found in the same deposit (Tamiami Formation, Pinecrest Beds of Florida), suggesting that they shared the same ecosystem. Image by Jonathan R. Hendricks. This work is licensed under a Creative Commons Attribution-ShareAlike 4.0 International License. Crabs are also important predators of snails and bivalves in marine ecosystems. They use their powerful claws to break the shells of their prey. Their attacks are not always successful in killing their prey, however. In some cases, the shell of the prey is damaged, but is later repaired as it recovers from the attack. Evidence of such attacks are commonly preserved as jagged, high-relief scars that cut across normal lines of growth. 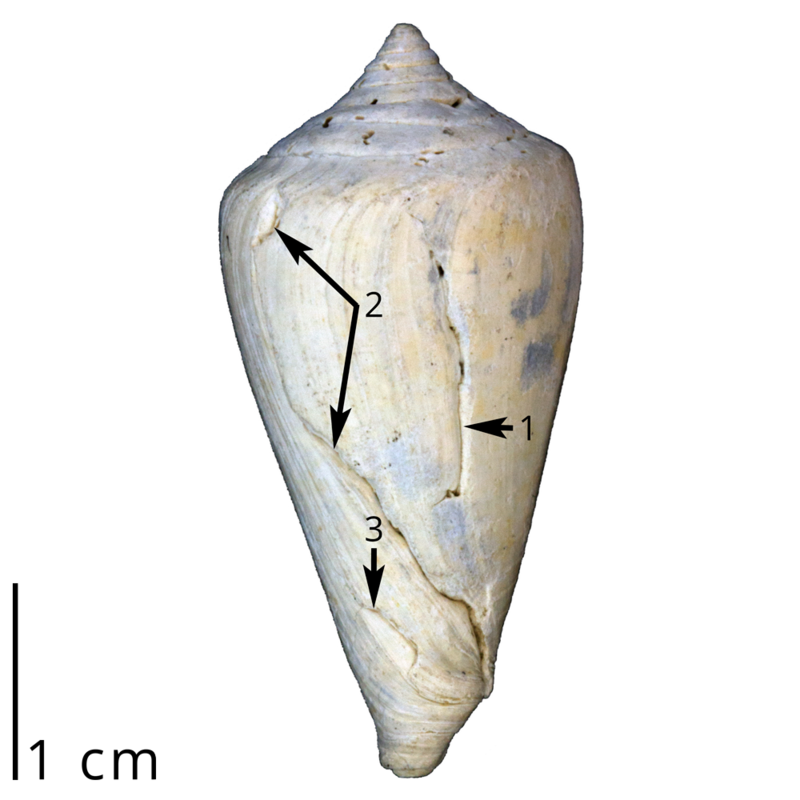 A fossil cone snail shell showing three different sets of scars left by failed predatory attacks by crabs. We know that the snail survived each attack because new shell was added after the break mark. Such feeding trace fossils are known as "repair scars." This shell is a specimen of Conus spurius and was collected from the Tamiami Formation (Pinecrest Beds) of Florida (PRI 70043). Image by Jonathan R. Hendricks. This work is licensed under a Creative Commons Attribution-ShareAlike 4.0 International License. Digestive trace fossils consist of fossilized excrement. These fossils are scientifically known as coprolites. Coprolites are scientifically useful because they sometimes tell paleontologists what types of food ancient organisms were eating. For example, some large Cretaceous coprolites contain fragments of dinosaur bone, suggesting that the excrement was produced by a large meat eating dinosaur. A coprolite specimen from the Oligocene of Clark County, Oregon (collections of the Paleontological Research Institution). Photograph by Jonathan R. Hendricks. This work is licensed under a Creative Commons Attribution-ShareAlike 4.0 International License.